The 5" Smash-Tech Gizzard Shad is the ultimate weedless swimbait when you want to perfectly mimic what giant bass love to eat. Whether it be during the shad spawn or on deep ledges the 5 inch Gizzard Shad is unmatched in detail and action. 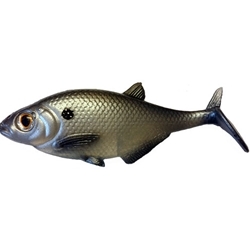 Each bait is hand made and airbrushed to produce the most realistic shad swimbait available. We recommend using a 6/0 Beast Swimbait hook for best results. 2 per pack.